So who wants to take up a collection for the $99 developer’s fee, grab a bit of Cocoa, and make a Newton Touch app? I’ve got $5 toward the effort! One reader, Simon, correctly pointed out that the software developer’s kit was actually free; it’s the right to upload software to, and therefore receive the blessing from, Apple’s App Store that costs $99. Is this even possible? Plenty have reported on the limitations imposed on software developers – no app can remain open in the background, no scripting, etc. – so that Apple can keep the platform secure. possible to solve the first issue by wrapping Newton packages and have them installed through iTunes which would give the per-application control back to Apple). There is also the lack of pen input and a very high resolution, yet small screen, which makes HWR impossible and hitting a Newton button extremely hard. But there has to be a way to, say, scribble something on your Newton Notepad app and have it show up in iPhone’s Notes. Or scribble in a contact into Newton’s Names and have it sync to Address Book. Same with Calendar and iCal. This would solve one of the main dilemmas today’s Newton user faces: the difficulty connecting a MessagePad’s information with OS X. If an iPhone could run a Newton app, syncing would be a breeze. On their own, the iPhone and iPod Touch are becoming what the Newton always dreamed of: a platform to organize your computing life on the go. So there really is no need for a Newton app other than to just play around with and show to your geeky friends. They’re based on two totally different input philosophies (though there is a stylus available for the iPhone now, as we’ve seen), and I can see why switching from one to the other would be pointless. Someone on the Newtontalk list brough up Apple’s possible resistance to a Newton app being made available in the first place. All applications have to be certified by Apple before users can download them from the App Store, and Apple probably has no interest in seeing its ten-year-dead OS making any sort of reappearance. There are still jailbroken iPhones and iPod Touches out there, though, that provide a handy bypass system. The idea of the Newton lives on in the iPhone: novel input mechanism, calendar and contact syncing, e-mail, web surfing, dock-loading applications, etc. 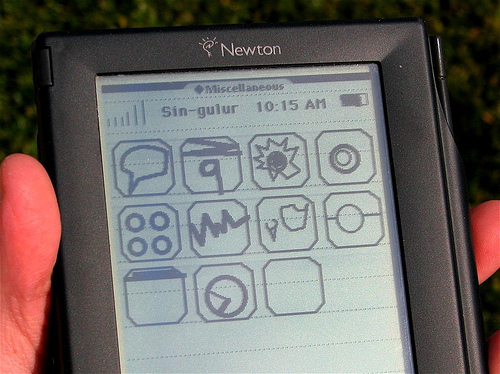 And when developer start churning out to-do apps and financial apps and gaming apps, all that will be left untouched will be the Newton’s handwriting recognition. The iPhone will be what the Newton wanted to be when it grew up, in full color. But when developers program videos like babes washing your iPhone’s screen, or apps that mimic the Nintendo Entertainment System (as Newton developers did with Newtendo), a fun Newton emulator doesn’t seem like such a worthless project. Posted by davelawrence8 at 7:36 am on March 20th, 2008. 5 comments... » Categories: community, DIY, ipod/iphone, newton, software. Tags: app store, emulator, ical, iphone SDK, ipod touch, messagepad, NES, newtendo, newton, newtontalk, OS X, sync. Subscribe via RSS. Posted by Update: Einstein emulator on the iPhone « Newton Poetry on April 9th, 2008. Posted by Handwriting recognition on the iPhone? « Newton Poetry on May 7th, 2008. Posted by Einstein emulator on Android: oh the possibilities « Newton Poetry on September 3rd, 2008. Posted by Make your own iPhone app with HTML « Newton Poetry on November 26th, 2008. Posted by Newton Poetry — NYT: original Newton MessagePad review on August 24th, 2010.